Dr. Kristin Kocsis examines a dog at the NRG Center, a Houston sports stadium that was became a temporary shelter because of Hurricane Harvey. Dr. Kocsis practices at the Banfield Pet Hospital in Pasadena, Texas. More than a dozen Banfield animal hospitals remained closed Sept. 15 as Texas, Puerto Rico and the Southeastern United States continued to clean up after hurricanes Harvey and Irma. Some 112 Banfield hospitals across Florida, Georgia, North Carolina, South Carolina and Puerto Rico were closed at the height of Hurricane Irma, the company reported. In Texas, where 107 of Banfield’s 1,000 hospitals are located, 55 had to shut down. Two Texas hospitals could not reopen as of Sept. 15 because of water damage from Hurricane Harvey. Irma-related power outages forced the continued closure of 11 hospitals. The Banfield Pet Hospital network and its foundation responded to the twin catastrophes by funding more than $147,000 worth of disaster relief grants to local nonprofit groups and agencies and by donating more than $36,000 worth of flea and tick preventives. “The number of pets in need following Hurricane Harvey and Hurricane Irma reinforces our belief that all pets deserve care, in the best and worst of times,” said Marta Monetti, senior vice president of corporate affairs at Banfield Pet Hospital and president of the Banfield Foundation. 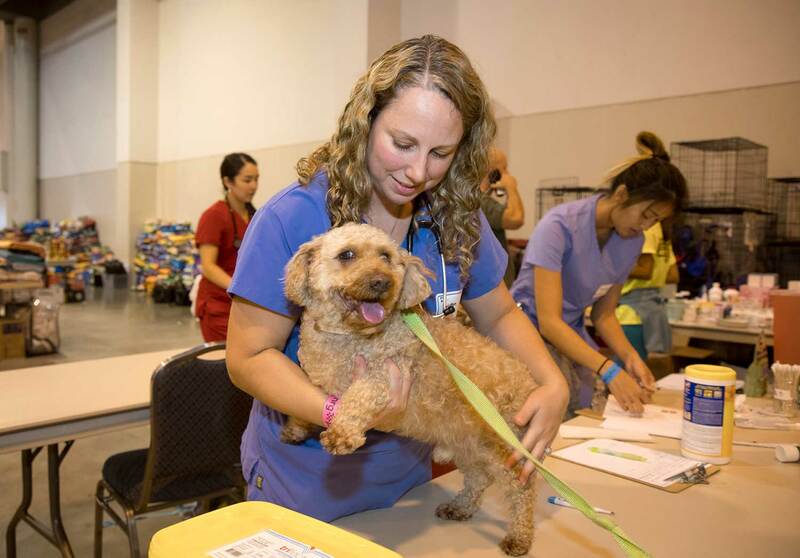 Banfield veterinarians and team members volunteered to work more than 640 hours at shelters, helping 1,816 pets. Jacquelyn Schrock, DVM, the company’s Houston medical director, witnessed the onslaught of Harvey and the charitable aftermath. “Even those of us within its path shared the feelings of helplessness that so many experienced watching the devastation caused by Hurricane Harvey,” Dr. Schrock said. “I was humbled by the droves of compassionate Banfield associates who donated their time to help pets in impacted areas.